The day full of excitement: Tamarite de Litera, Lleida and via Blanes to Barcelona. On the 7th of January early in the morning at 7.30, the pro lifers from the town of Lerida-Lleida left for the shrine of Torreciudad to take over the care of the peregrinating Icon of the Mother of God. It was particularly cold for the south of Spain – 2 degrees below zero. 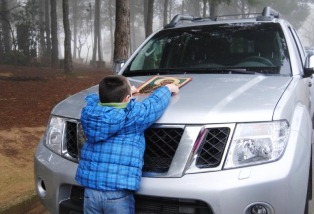 At 9AM, after a solemn farewell the “Life Mobile” went to Tamarite near the town of Lerida. The Mother of God came to Tamarite before 11AM as it was not a long distance. The Icon was carried into the church of Santa Maria la Mayour (the Mother of God the Major). The Holy Eucharist was celebrated by fr. Jaime Clusa who did his best to make the pilgrimage of Our Lady of Częstochowa in Huesca, Torreciudad and Tamarite de Litera a success. 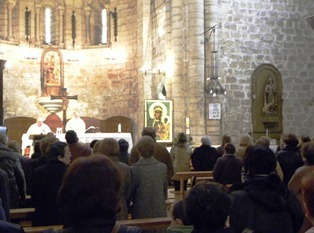 During the Holy Mass in Tamarite de Litera he preached a passionate homily in defence of life. He explained the idea of the peregrination “From Ocean to Ocean” and the need to get personally involved in the defence of conceived life or contesting euthanasia. The church was full of people. The next place to visit was the school of the Mother of the Saviour in Lerida-Lleida. The stop was short but despite the troublesome fog, quite a large group of people gathered to meet the Mother of God. The chairwoman of the committee from the province of Lleida-Lerida Mabel Albero said: The moments we experienced accompanying the Icon were amazing. Particularly the farewell was emotional. There another group of pro-lifers from Gerona-Girona took over the care of the Icon and they left for Blanes. Blanes is on the coast of the Mediterranean Sea in the province of Gerona in Catalonia. The Mother of God arrived here at 7 in the evening. 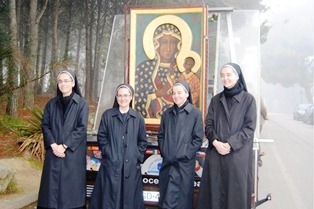 The Holy Rosary in the intention of the defence of life and family was said. Next the Holy Eucharist was celebrated during which the preacher presented the idea of the peregrination “From Ocean to Ocean”. After the Mass a Polish woman, who lives in the town, read out in Catalan the story of the Częstochowa Icon and gave her own testimony of her love for the Mother of God. The car was changed and the Life Mobil left for Barcelona. Barcelona was reached very late. However in the parish of the Miraculous Medal a group of Poles with their pastor Fr. D. Xavier waited patiently for the arrival of the Mother of God in Her Częstochowa Icon. They prayed till late at night.